Great place for kids and parents too! 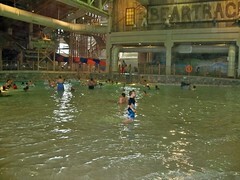 The indoor waterpark at Great Wolf was fantastic. Not too big, not too small. We could always locate the kids and establish meeting spots. Plenty of slides and other fun activities to keep them busy and get out all that boy energy!! Plus, a Pizza Hut and ice cream shop just outside the main door to the waterpark. Everything is indoors, so there's no walking outside in your bathing suit (it was January) if you don't want to. The rooms were good, my son woke with a rash/bumps on his side and to this day we still don't know if it was something from the waterpark or the bed, even after a Dr. visit. It did clear up in about a week, though, no harm done. We would go back and look forward to trying another Great Wolf location soon! We went to the Great Wolf Lodge for my oldest girl's 10th birthday - so I was the only adult with three tweens, two big kids, and one 7 month old. And I can say that we had a great time! I love that the water park was contained but provided plenty of fun options, so I could let the bigger kids ride the attractions on their own and check in with me at obvious landmarks like the big bucket at designated times. The rooms were so much fun too. A separate kids area in the suite made the kids feel special - and gave me a little bit of privacy. Being able to visit the water park and take a snack break in the room down the hall was just so convenient. My kids have been talking about Great Wolf Lodge since we left and are eager to go back! Since the rooms are so close by, don't load up with too much stuff when you go to the water park because you'll just have to keep track of it! It's easy to go back to the room. And easy to use the towels provided at the park and not have to keep track of your own! While there were plenty of food choices on site, we did choose to bring our own snacks and went out to dinner at one of the many choices nearby to save a little bit on our visit. Absolutly loved this hotel! Kids had a great time the whole time we were there and never got bored. Take some food to keep in your room as the food is quite expensive. We arrived and our hotel room was amazing. The whole place was magical. The only negative thing I can say is the wait staff, they were not very attentive when they were not even busy. Check out the mall that is right next door if you need a break from the water slides. 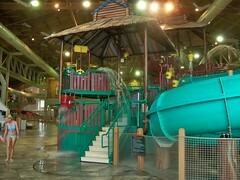 Great wolf lodge was a great overnight getaway on a cold weekend. The pools were all warm and the kids lived swimming and playing for 2 full days. Budget extra money. While a ton of fun, it isn't a cheap thrill. Always great fun for our family. We've been 4 times now and are planning our 5th trip. It's has everything we could want. We love running around with the kids in the water park, Magiquest, and just having fun in general. The weekends are always busier. Go in the middle of the week if possible. Really fun waterpark with lots of activities for kids. We stayed in a wolf den room and the kids really enjoyed having their own space with bunkbeds and a tv. Food at the restaurant was surprisingly good. We ate at the dunkin donuts on the property for breakfast. Cons - waterpark is chilly and all that rushing water plus kids makes it very loud. You have to be 48 in tall for the really cool big slide. Arcade needs some serious updating. Bring your own adult beverages and keep them in the mini fridge in your room to enjoy on your balcony after the little ones have gone to sleep.